We have a trip to Seattle and Vancouver on our horizon, and while we were booking our last nights hotel and pricing out rental cars I decided to double check our flight times, as they had been changed a few times, and noticed that on our flight out to Seattle we were booked in four seats scattered throughout the plane, all middle seats. Well. This was certainly a problem, since two of the passengers are 2 and 5. While it would definitely make for an easier flight for me and my husband if someone else was watching our kids (I kid. Kind of.) I knew this wasn’t going to work. To add to the confusion when we booked the tickets we booked 2 on one itinerary and 2 on the other. This isn’t normal for us, but we used Delta points for one and paid for one, so that was one itinerary, and then we used Chase Ultimate Rewards points for the other two, and those are booked through Chase. So, I called Delta, and, in a case of catching more flies with sugar than vinegar, I put on my sweetest voice, explained the situation, and begged for help. After a long conversation and some confusion with the two itineraries she was able to open up some blocked seats in the back (blocked for what I have no idea) and get me next to my daughter and my husband with my son. They are 10 or so rows in front of us but that didn’t matter. We know flying with kids is stressful, and the last thing you need is to get to the airport and discover this situation. We have a few suggestions to help you before your travel day. Be sure you always confirm your seats before you get to the airport. Even if you booked seats together originally anything can change your seats, from an aircraft change to departure time changes. If you have the ability to the best way to confirm seats together is to pay extra to pre-book your seats. This is just another example of airlines milking passengers for every last penny they can, but if it ensures that your kids won’t be sitting 10 rows away with strangers then it is probably worth it. Many airlines, usually non-US domestic carriers, make an effort to keep families together. British Air, for example, only opens up seats 24 hours before your flight time if you haven’t paid to book your seats earlier. But they do everything they can to keep families traveling together, and we have never had to pay for seats on BA and have always been booked in together. If you call the airline be nice! I have a hard time always subscribing to this, particularly when I feel customer service people are not trying to be helpful, but the reality is that the nicer you are the more likely they will be to help you out. Don’t set your expectations too high – for example, with the four of us it would have been crazy to demand 4 seats together. But getting 2 sets of 2 seats together is better than all being apart. And, finally, if nothing else works, go to the airport early, and ask for help. Beg for help. Show them your adorable children and hope they take pity on you and work it out for you. If not ask nicely on the plane, and hopefully someone will switch. While I understand that if someone has paid for a premium seat they shouldn’t have to switch I would hope that they would be accommodating enough so that a young child wouldn’t be sitting alone. Have you had this happen? How did you work it out? This entry was posted in Uncategorized and tagged kids on planes, seating on planes on May 7, 2013 by andrea922. Recently I had the good fortune to go visit one of my oldest and dearest friends in Pittsburgh, bringing with me my daughter, L, to meet her new daughter for the very first time. When you get to have girl time with one of your favorite friends and both your daughters, well, it is worth the small amount of time you are actually there. While we traveled up on a Friday afternoon and came back on Sunday it was cold and we had naps to work around, but we did manage to see some kid friendly sites in the short time we had. And, since my husband and I met at a wedding in Pittsburgh, well, it does hold a special place in my heart. We were lucky enough to have an empty seat on both legs of the flight, and with L being a lap ticket I graciously accepted the extra seat for her to stretch out in. She managed to charm the 60+ grandmother and the 21 year old Irish man sitting next to us, respectively, so that certainly helped too. While we stayed with my friend this time we have stayed at hotels on other trips there, including the Omni William Penn and the Holiday Inn Express South Side, very different hotels but both family friendly. With a cold and rainy day ahead of us we headed to the Children’s Museum of Pittsburgh, where we explored the three levels of this interactive, hands on museum which was perfect for my not quite 2 year old. There were things to build, to climb, a replica of the Neighborhood Trolley from Mr Rogers Neighborhood and the characters from Daniel Tigers Neighborhood, which is the only she really likes to watch, so for adults who remember Mr Rogers from their youth and kids who love Daniel Tiger it is a win win for everyone. They have an amazing life size lite brite area, and a water area which has since been redone and opened, and is supposed to be better than ever. The only downside was it was really busy, but it was a Saturday and it was freezing out so lots of families had the same idea we did. They do have a cafe there but we didn’t check it out. We headed to Grille 36 for lunch to meet another friend, and it was located right next to Heinz Field, home of the Steelers. If you visit with older kids you could take a tour of the stadium. The restaurant was very kid friendly, and there were lots of families in there, which is always a good sign, especially if you worry about your kids being loud! While our day was then filled with naps and dinner and bedtime there are other things in Pittsburgh that would be great to see with kids, including the Carnegie Science Center (my son would have loved this! ), the National Aviary (a bird zoo! ), the Duquesne Incline at Mount Washington and the Pittsburgh Zoo and Aquarium. If you want to check out a well known Pittsburgh tradition you can eat at Primanti Brothers, where the fries come on the sandwich instead of next to it. The city is often overlooked amongst its bigger East Coast neighbors, but with its many attractions, its many bridges and stadiums, it is a great, reasonably priced family destination perfect for a weekend trip not to be missed! Have you been to Pittsburgh with kids? What did your kids enjoy doing? This entry was posted in Uncategorized and tagged children's museum, pittsburgh with kids, zoo on May 6, 2013 by andrea922. I have spent a lot of time in Spain, both as a child, with my parents, and with my family. Our son has been to Spain more than once, and our daughter made her visit there last month. Even though we have no familial connections there we do have good family friends there, who I lived with during a Summer when I was 10. So, naturally, it was logical that it was the first place we took F to when he was a baby. He wasn’t even 10 weeks, we packed him up and headed out, to the Galicia region of Spain and the Northern part of Portugal. As soon as we started planning the trip I knew exactly where we needed to stay, in Paradores, which are the only way to go in Spain. Paradores, which are government run, are luxury accommodations that are in old castles, convents, monasteries, convents, fortresses and other historic buildings. They are, in a word, awesome. They are old but modern, historical but luxurious. We have stayed in them throughout other areas of Spain, so we were excited to try out some new ones on this trip. The first one we stayed at was in Ourense, in an old Monastery. It was peaceful, and exactly what we needed to start our trip. From there we headed to Portugal, and we found the Portuguese equivalent, a Pousada. We checked into the Pousada in Guimaraes, and had the same tranquil experience, in a historical monastery. Next stop was Tui, where we stayed in an old manor house, followed by Baiona, where we slept in an old walled fort. F was treated like royalty by all the employees, and everyone was very accommodating to this haggard couple with a new baby. But the highlight of our trip was, hands down, Santiago de Compostela. Not only is it an amazing town, with a Cathedral that isn’t rivaled by many others, the parador lays claim to being ‘possibly’ the oldest in the world. I can’t vouch for that, but I can vouch for the magical powers it had on our hardly sleeping 10 week old who slept 12 hours straight while we were there! The Parador in Santiago de Compostela, rumored to be the oldest hotel in the world. The next time you are in Spain or Portugal consider skipping the chain and boutique hotels and check these out, kids will love the history and you will love the luxury. You will not be disappointed! This entry was posted in Uncategorized and tagged hotels with kids, paradores, pousadas, spain on May 3, 2013 by andrea922. This is my new weekly installment of Throwback Thursday, where I revisit the very trips that were so special to me, and to remind me of why we want to raise our kids to be world explorers themselves. 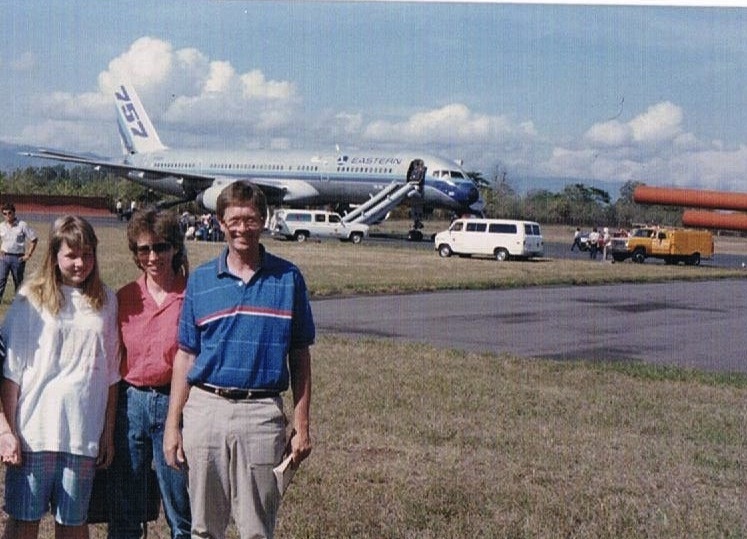 When I was 12, many years ago, my parents decided to take me to Costa Rica for Spring Break. Not only did I not know where it was, but I was sad we weren’t heading to Panama City, Florida, like the rest of my classmates. When they said I could bring my best friend I was more excited, and away we went, to this mysterious land in Central America, confusing everyone in the 7th grade. Our week in San Jose and Manuel Antonio, long ago before it became overtaken with tourists, was amazing. We sat on beaches and watched monkeys swinging from trees, we saw sloths crossing the road, we saw spiders bigger than you could ever imagine and had experiences that we would never forget. But none of these things were the highlight of our trip. That came on our flight home. As we took off from San Jose, headed for Miami, we excitedly chatted about our trip, thinking about what we would tell our friends. We were headed towards the ocean when suddenly the plane made a sharp turn, heading back towards the airport. The pilot came on and calmly said the following. Cue silence, followed by gasps and shouts and crying. My parents, trying to keep two 12 year old girls calm, said if there was a bomb it would be an altitude bomb and that is why we were flying so low. For years I believed this and didn’t realize my dad made it up, which was pretty quick thinking on his part! We landed, safely, in a field, far away from anything, on the off chance the plane exploded when we touched ground, and there was a lot of commotion. We watched as some stairs were driven out to the plane, only to find out they were too short. One of the flight attendants completely panicked and pushed the buttons for the slides, and of the two one flew completely off the plane, leaving one slide for all of us to go down. They repeatedly told us to leave all our bags on the plane, calmly walk to the front, cross our arms and jump. The first guy that jumped flew off the bottom and broke his leg, and was carried away on a cloth stretcher. By the time we got to the front we forgot the fear of what was going on and reveled in the excitement. I remember crossing my arms, jumping, sliding and at the end, with a pretty big distance between the bottom of the slide and the plane, someone grabbed me and sort of pushed me towards a fence a ways away. We had to run to the fence, and wait until everyone was off the plane, and then we all claimed our luggage, I guess with the thought being that if something was left it could be the bomb. At this point my dad decided we should get pictures, as only my family would do. Now, this is brave of me to do. These pictures? They are rough. It was the late 80s and we did not look good. At all. Please overlook that and instead take in the excitement of what was going on behind us. It was pretty awesome in retrospect. Standing in front of the Eastern Airline plane with the suspected bomb on it. We were all taken to the airport, where we had to wait all day for another plane to fly down from Miami. We never did find out what had really happened, but it didn’t really matter, especially not to us. We came back to middle school and we were rock stars for our amazing spring break story. Do you have a memorable vacation from your childhood? Share it with us! This is part of Photo Friday at Delicious Baby! This entry was posted in Uncategorized and tagged emergency landing, spring break, throwback thursday on May 2, 2013 by andrea922. We took our then almost 2 year old son to Savannah for a long weekend, and in an attempt to see the sights we took him on a trolley tour, on a cold, rainy day. He didn’t care about the sites, or what the tour guide said. He did, however, enjoy his toy train and car and the tour sticker. Just another example of how adaptable kids can be doing ‘grown up’ things on vacation! This entry was posted in Uncategorized on May 1, 2013 by andrea922.